By May of 2018, almost fifty-four million Americans prepared and e-filed their own taxes for the 2017 tax year. This “Do It Yourself” approach should not be a surprise in this growing age of technology, software, and online resources. But is the DIY approach better? Well, there is a pretty straight forward answer to this question, which is… Not if it ends up costing you more in tax because you did not use a professional. Okay, I know that might sound a bit sarcastic, but it really is the answer. 2018 was the year of Tax Reform. Things are no longer what they once were in the tax world. And how this applies to your situation may prove to be quite challenging when it comes to filing this year. So if you have never consulted with a tax professional, this might be a good year to do so - but you may also be fine without one. 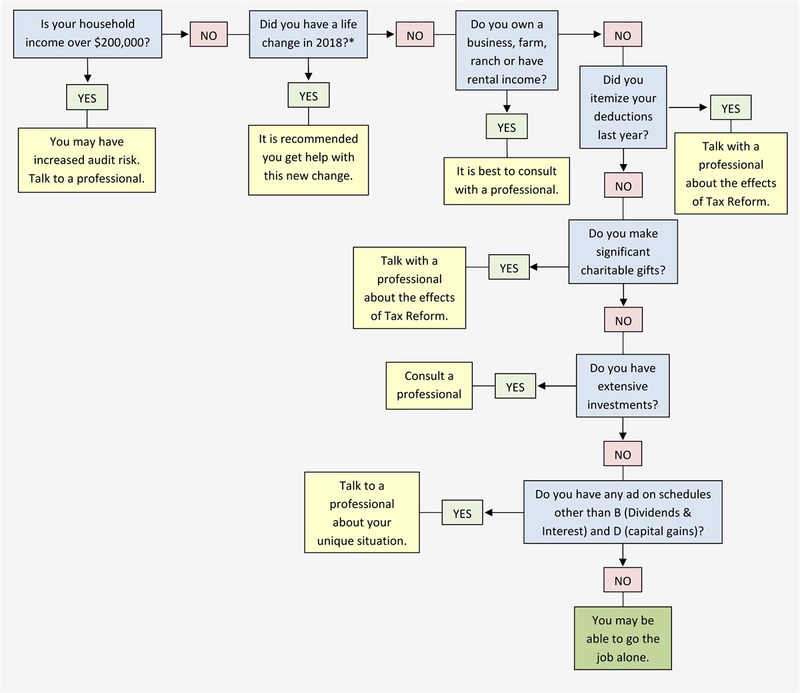 Follow the flow chart below to see how your 2018 taxes might need to be handled. Remember there are tons of hidden opportunities you may have with this window during the “Tax Reform Years.” It may be too late for you to take advantage of any for last year, but it’s not too late – or too early – to begin taking advantage of planning for this year. Talk with your Life Planner and tax professional to determine when “DIY” starts costing your more than your taxes. *Life Change: Career change, retirement, home purchase or sell, land or business purchase or sell, marital status, new family members, care giving, inheritance, etc.